Shopping Tip: The Freshest Shrimp are Frozen! Shopping Tip: The Freshest Shrimp are Frozen! Shopping Tip: The Freshest Shrimp are Frozen! Home » Blog » Shopping Tip: The Freshest Shrimp are Frozen! This may sound strange, but the “fresh” shrimp that’s on ice at the grocery seafood counter is, the majority of the time, not as fresh as the bag of shrimp in the grocers freezer! Which Shrimp are Really Freshest? Most often, frozen shrimp is a smarter purchase than fresh. Thaw them yourself just before cooking and you will have much fresher shrimp than if you would have bought them “fresh”. To defrost frozen shrimp, place them into a colander and run cold water over them for a few minutes. Voila – fresher shrimp! Why is frozen shrimp usually fresher and an overall smarter purchase than fresh shrimp? 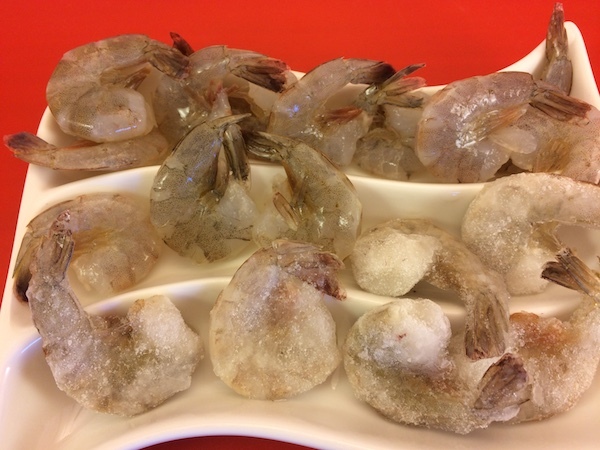 Since fresh shrimp has a very short shelf life, almost all shrimp are frozen right after being harvested. This is done in order to preserve them during the shipping process. So, with the possible exception of those shrimp purchased right along the Gulf of Mexico and those purchased from live tanks, the vast majority of “fresh” shrimp were frozen shrimp when they arrived at the store. The shrimp were thawed once they reached their destination and then labeled “fresh”. Remember, defrosted shrimp are only good for about 2 days. So, now that we’ve established frozen shrimp as a smart purchase, other questions arise. Should shrimp be purchased headless? For shrimp purchased live or right off the boat, head-on can be a good option. If the shrimp heads are boiled, they can make a great seafood stock. If shrimp are cooked with the heads on there is a bitter tasting juice that comes out of the head once broken off that many people enjoy. Some people even enjoy eating fried shrimp heads, but it’s definitely not for everyone. If the shrimp are not truly super fresh, then the heads can a have negative effect on their quality. The heads contain enzymes that begin to break down the actual shrimp flesh as soon as the shrimp die, causing the shrimp to loose its firm texture after just a few hours. If the heads are removed prior to shipping, the shrimp will remain firmer than those with their heads. Should the Shells be On or Off? 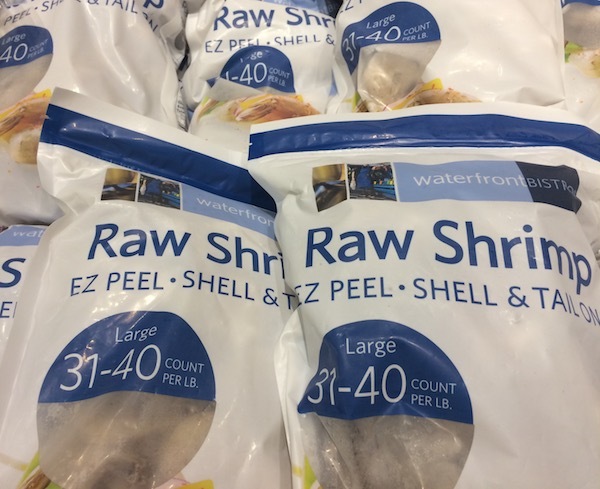 Shell on shrimp tend to cost less. Shell on shrimp tend to be slightly sweeter, more flavorful and tenderer when grilled. The shells add flavor to the shrimp, the dish or the broth – depending how they are cooked. Shell on generally shrimp look prettier when served as shrimp peeled by machines can get mangled and squished during the process. EZ-peel shrimp are split and deveined for you. They can make life easier, while still maintaining the advantages of having the shrimp shells. Although, this option may not produce as uniform of a result as if you carefully shelled them yourself. For either type of shell on shrimp, hold onto those shells. Even if the shrimp are shelled before cooking, the shells can be simmered with aromatics to produce a flavorful seafood stock, sauce, or oil. Peeled shrimp are the easiest option. But… they are also the priciest, least flavorful and sometimes the least presentable of the options. Shrimp cook very quickly, in minutes actually. Overcooked shrimp become small, tough and rubbery. If you want a quick shrimp cocktail, which is generally served cold anyways, then cooked shrimp make sense to purchase. Otherwise, let the shrimp absorb some flavor from the sauce while being cooked in a dish and purchase them raw. To find out how long shrimp lasts, check out shrimp page. To find out how to bbq shrimp without losing them in the grill, see our skewer shrimp post.